Skeptics and believers are constantly combating each other as to whether or not there is intelligent life in the universe. Skeptics use lack of evidence as their main offensive and defensive weapon, but here I will submit to you 5 amazing pieces of evidence that suggests that intelligent extraterrestrial life exists. George Bernard Shaw once famously quipped, “We learn from history that we learn nothing from history”. This quote is fitting to this piece of evidence that suggests the UFO phenomenon has been around as long as human civilization has existed and yet it is consistently dismissed. Today many UFO sightings are often explained away as being the US military testing some new technological weapon or plane, but this explanation cannot be used in a time when human flight was impossible. The painting above is titled "The Madonna with Saint Giovannino" and dates back to around the 15th century. The painting depicts the Virgin Mary in the foreground, and in the background is what appears to be a man looking up in awe at an object that is strikingly similar to our modern day perception of a UFO. This is not the only example of UFOs in ancient art. There are literally hundreds of examples of objects in the sky in many paintings spanning across the centuries. Strangely, the majority of the paintings depict UFOS in connection with a spiritual figure or experience. This could be how the people of the period interpreted the things they were seeing or perhaps there is a literal connection between the spiritual and UFOs. Erich von Däniken, author of the famous and controversial Chariots of The Gods, suggests that our gods and angles maybe intelligent aliens. In the Old Testament, The Book of Ezekiel discusses an encounter with a strange flying object made of metal that took the shape of a wheel. Inside were four living creatures that looked like humans. Many people believe the Bible to be the literal word of God; it should be especially hard for those people to ignore this evidence. It is the Gospel after all. Many may have a hard time taking the theories of Däniken seriously, but even respected astrophysicist Carl Sagan believed that we should seriously consider the possibility that extraterrestrial contact occurred in the past, so we should not completely dismiss this idea. Three days into the Apollo 11 flight the astronauts on board sent a strange message to mission control asking, “Do you have any idea where the S-4B is with respect to us?” The astronauts were asking where the final stage of the rocket was, which had been detached two days prior. The reason for this inquiry was because something was riding along side of the rocket and if it wasn’t part of the rocket, Apollo 11 had a visitor. The crew on board did not want to make a big deal out of the object for fear that it would cause a panic and mission control would order the astronauts to abandon the mission. “The three of us were not going to blurt out, ‘hey Houston we got something moving along side of us and we don’t know what it is’ we weren’t about to do that…someone might of demanded we turn back because of aliens or whatever it is,” said astronaut Buzz Aldrin when discussing the situation at a later date. Mission control did answer the astronaut’s cryptic question about the location of the S-4b unit. The unit was 6,000 miles from their location. What Aldrin and the other three astronauts were looking at was an Unidentified Flying Object exhibiting an intelligent flight path. In fact, according to Dr. David Baker, an Apollo 11 Senior Scientist, astronauts seeing UFOs is not uncommon and dates back to the early earth orbit space flights. If your friend who works at the video store claims to have seen a sea monster, his story has very little credibility. If an experienced Naval Captain claims to have seen a sea monster then his sighting has tremendous credibility. If experienced and respected astronauts are seeing evidence of intelligent life outside of Earth it should also be taken very seriously. 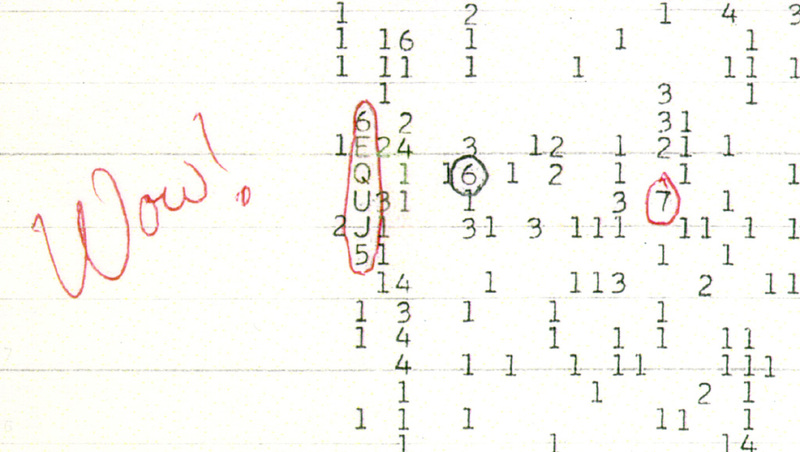 In 1977, at Ohio Sate University, The Big Ear radio telescope picked up an unusual signal. Big Ear used numbers and letters to determine the strength of a signal, 0 being meaningless noise and Z being a strong radio signal. An astronomer, Dr. Jerry R. Ehman, studying the data from the telescope was shocked when a radio signal clocking in at ‘6EQUJ5’ came from a seemingly empty spot in space. Ehman was so shocked that he circled the signal on the data sheet and simply wrote ‘Wow’. The transmission lasted 37 seconds and came from the Sagittarius constellation. Even more interesting is the fact that the nearest star in that specific direction is 220 million light years away. In other words, the signal came from an empty spot in space. It is also interesting to note that the signal had all the characteristics of an interstellar broadcast. Some have tried to explain that the signal is somehow of an Earthly origin, but this seems unlikely as the signal was in a frequency that is internationally banned on Earth. The conclusion that has the most evidence going for it is that it is of an extraterrestrial origin, and because there are no stars near where the signal was found one can conclude that it came from a spacecraft manned by intelligent entities. N = the number of civilizations in our galaxy with which communication might be possible; R* = the average rate of star formation per year in our galaxy ƒp = the fraction of those stars that have planets ne = the average number of planets that can potentially support life per star that has planets ƒℓ = the fraction of the above that actually go on to develop life at some point fi = the fraction of the above that actually go on to develop intelligent life ƒc = the fraction of civilizations that develop a technology that releases detectable signs of their existence into space L = the length of time such civilizations release detectable signals into space. 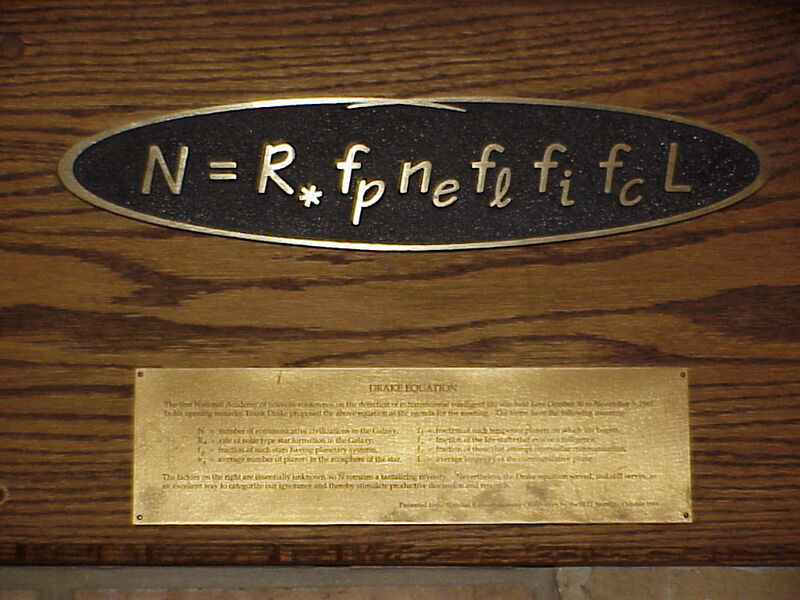 Radio astronomer Frank Drake developed the Drake equation so he could estimate the number of planets harboring intelligent life in the galaxy by taking into consideration the factors listed above. A rigorous estimate using the Drake Equation was implemented in 2001, which also took into consideration the number of planets that are in the habitable zone (The habitable zone is an area around a star were water is in liquid form, temperature is ideal, and photosynthesis is possible). The results found that hundreds of thousands of life-bearing planets statistically should exist. It also suggested that a habitable planet like the Earth should exist just a few hundred light years away. I find it unfair if I did not now also give equal mention to the Fermi paradox. The Fermi paradox states that if so many planets exist with intelligent life why is there a lack of contact between the intelligent life and us and why is there such a lack of physical evidence of said intelligent life. The paradox exists in that the Drake equation statistically proves life should be abundant and yet physical evidence says otherwise. It is hard to combat the arguments from the Fermi paradox except that some physical evidence does exist as you can see from this writing. In 2003, astronomers with the search for extraterrestrial intelligence (SETI) used a massive telescope to examine sections of the sky where they had previously found unexplained radio signals. They found another radio signal that was even stronger than what they had previously found. The signal came from an area in space where there are no planets or stars and strangely was at a frequency that hydrogen absorbs, ensuring that the signal would be strong and could travel great distances. The signal was detected on three separate occasions. "The signal is moving rapidly in frequency and you would expect that to happen if you are looking at a transmitter on a planet that's rotating very rapidly and where the civilization is not correcting the transmission for the motion of the planet," Says USB researcher Eric Korpela. Considering the signal operates as if it is intelligently operated and the fact that it was detected multiple times one has to consider this SETI signal the best candidate for proof of intelligent life on other planets.